The Indiana University Proton Therapy Center will close in December, marking the first time a proton-beam therapy center in the U.S. has shut its doors since the rapid proliferation of the costly treatment centers began about a decade ago. University executives and an independent review committee attributed the center's financial losses to a range of issues, including the cost of maintaining its aging cyclotron, but the committee also suggested the industry may be on the verge of a “proton bubble” as the centers struggle to serve a sufficiently large patient population. Many of the centers have based their volume expectations on treating prostate cancer patients, but insurers have increasingly started to push back against providing coverage of proton therapy for these patients because of a lack of evidence proving superior benefits over other treatments. Blue Shield of California and Aetna last year said they would no longer cover proton therapy as a treatment for localized prostate cancer. Cigna Corp. does not cover proton-beam therapy in the treatment of prostate cancer either. The IU center, located in Bloomington, Ind., was the third in the U.S. when it first opened its doors in 2004. It's jointly owned by the Indiana University Research and Technology Corp., a not-for-profit that handles IU-related business development, trademarks and intellectual property, and IU Health, an Indianapolis-based health system that owns 15 hospitals in Indiana. “Unfortunately, rapidly advancing technology and changes in the dynamics of cancer treatment have left us with a dwindling patient base and a facility that is many times more expensive to operate than most of our competitors in this field,” Dr. Jay Hess, vice president for clinical affairs and dean of the IU School of Medicine, said in a statement announcing the closure in August. There are currently 13 proton centers, including the IU center, operating in the U.S. and at least 12 more facilities in development, according to the National Association for Proton Therapy. A facility can cost more than $200 million to build. Even the least costly proton centers still have price tags of around $30 million each. When faced with the prospect of spending millions of dollars to update the IU center's equipment, the university called for an independent review of the facility. The review committee unanimously recommended closing the center. In the committee's report (PDF), the reviewers highlight many of the issues affecting the proton industry as a whole, including the lack of completed randomized clinical trials, improvements in alternative treatments, changing care patterns for patients with prostate cancer, and the rise in new payment models, such as bundled payments, that may remove incentives to use the therapy. “It is, therefore, quite possible that we are on the verge of a 'proton bubble' with the more indebted centers or those without a strong patient supply line closing,” the committee said in the report. While proton therapy has been most widely used in the treatment of prostate cancer, it also can be used to treat lung cancer, pediatric tumors and cancers of the head and neck. Using protons to treat pediatric cancers, for example, is considered effective by many practitioners. Among the IU committee's recommendations was a suggestion that the hospital system consider building a single-room proton facility at the Riley Children's Hospital in Indianapolis. “It became clear that there is no overriding drive to maintain this facility in the face of mounting losses and required investment to maintain operation,” the report said. The losses and challenges were clearly outlined in the report. The IU center requires 63 people to staff the cyclotron, spelling high labor costs. The technology, which was adapted from a research cyclotron, needed a $30 million upgrade. The Bloomington site, which is an hour's drive from Indianapolis, is not ideal for clinical-trial participation because it requires most patients to travel. The center reported a $3.5 million operating loss in fiscal 2013. Another challenge it faced: newer centers are expected to be opened by University Hospitals in Cleveland, Ohio, and by the Mayo Clinic in Rochester, Minn., key referral markets. The closure will have “minimal to no impact on the proton community outside of Indiana,” said Leonard Arzt, executive director of the national association. 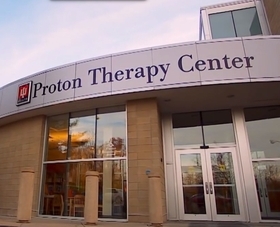 The IU center is not the only proton therapy facility to struggle financially. ProCure, a Somerset, N.J.-based private-equity operator of three proton centers, in 2013 sold its stake in a proton center in Warrenville, Ill., to its partner, Cadence Health, after undergoing a financial restructuring. Some experts say they don't expect more closures. “I don't get that sense,” said Dr. James Yu, assistant professor of therapeutic radiology at Yale School of Medicine. But he does anticipate more reimbursement pressure and pushback from insurers for proton treatments beyond prostate cancer. “As insurers become more restrictive in paying for prostate, I hope they also become open and supportive of agreed-upon treatments rather than restricting proton treatments across the board,” Yu said.